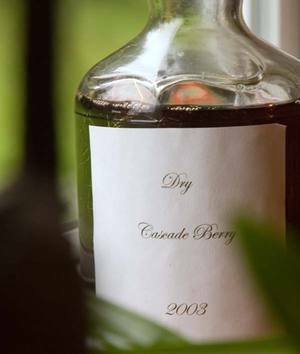 My new favorite winery is a private mini-mini-batch bottler who produces a variety of fruit wines — berries, apple, and apricot — and goes by the name of George. Since discovering this vintner a year or so ago, I've been fortunate enough to come across bottles of apricot, blueberry, and some dry-enough-to-induce-puckers cascade berry. (say that really fast, especially after a few glasses of it, i dare ya!) Reminiscent of a late-summer afternoon, with the scent of fruit floating in with the coolng afternoon breeze, these are wines to savor. Each one has been marvelous, rich with the flavor of fresh wild/organic fruit while lacking even a hint of the cloying sweetness that reminds me why I stopped drinking fruit wines years ago. Other favorite wines come from my friends up at The Inn at Lucky Mud. 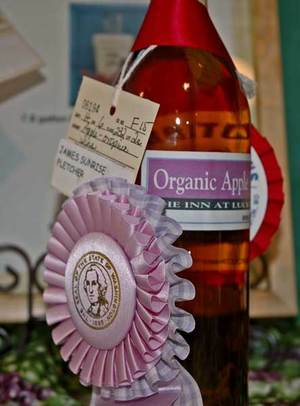 Shown here is a bottle of their organic apple wine, made with apples from "Pioneer trees" — those being the ones planted by the first white settlers in our valley — which won the Governor's Award at last year's fair. (George, the other vinter, won several prizes as well...even some for beer, but that's another story.) Last time I visited the Inn, there was a tiny batch of cabernet going — and by tiny I mean less than five gallons — their first from some grape vines they planted a while back. Too bad the pioneers didn't bring grapes too, it'd sure be nice to have a valley full of wild wine grapes! For those of you without your own network of friends who share their homemade wine, I offer a pair of maps to help you find the next best thing. It strikes me that this might be a great alternative to the usual trip-planning sites. Placemapper also has maps for Portland and Seattle metro area breweries as well. Just remember to take a designated driver...or a cab.